The Venus statue, which would have had religious significance, is missing her head and would have been standing on a pedestal but she is reasonably well intact, according to Senior archaeological officer Fay Minter. Courtesy: John Nunn. 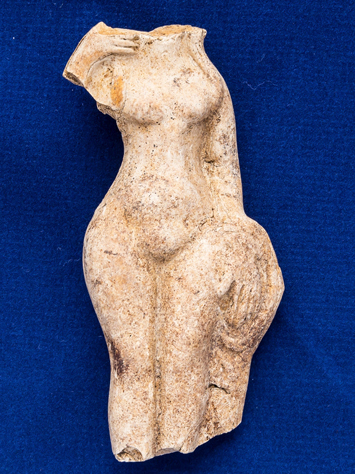 A rare find was dug up by volunteer archaeologists during a rescue excavation at a property in Long Melford: A six inch tall figurine dating from the first or second century, known as a ‘pseudo Venus’. The find could point to the village being the “missing link” in a chain of Roman forts, it has been claimed. Archaeologists claim that the statue would have had religious significance. Several statues of this kind are recorded as being found along Hadrian’s Wall where there was a series of Roman military forts. “Although we have no definitive proof that’s the case in Long Melford, it would have been an appropriate site for a Roman fort,” John Nunn added. According to Mr. Nunn’s research, it could be the missing link in a string of forts across East Anglia which includes known sites at Colchester and Ixworth. “The forts were usually sited within a day’s march of each other so it would fit,” he explained. Archaeologists know there is a Roman town in Long Melford under the Medieval and the modern village, but to confirm there was a Roman fort there, they would have to make more early military finds such as armour or buckles. The figurine will be sketched and analysed by members of the county council’s archaeology team before eventually going on show in Long Melford. Archaeologists are shortly due to start a week long ground radar survey of the area to see if they can locate any new Roman roads or buildings that could shine light on the recent discovery.